Our top waffle makers remain the Cuisinart Round Classic Waffle Maker for American-style waffles and the Presto FlipSide 3510 for Belgian-style waffles; both perform well and are very affordable. We also have recommendations for easy-to-clean waffle makers, stovetop waffle makers, a camping waffle maker and, new in this year's report, the super high-tech BWM640XL Smart Waffle Pro. Specs that Matter Waffle type: American, makes 1 Cook time: 3 min Dimensions: 8.5" x 4" x 11"
The Cuisinart Round Classic Waffle Maker wins this category by a landslide, not because of fancy bells and whistles but because of the one thing it does very well: Turning out thin, crunchy American-style waffles. Cooking time is quick -- about three minutes per waffle -- and as long as you apply a little oil to the grid, its non-stick coating releases those waffles quickly and cleanly. The three-year warranty is impressive in this price range. 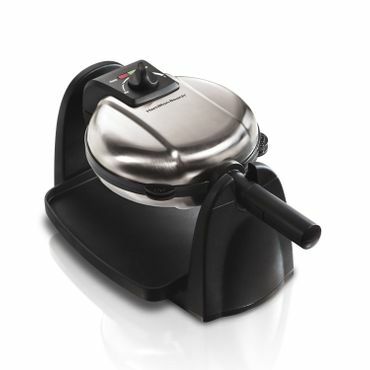 Specs that Matter Waffle type: Belgian, makes 1 Cook time: 4-5 min Dimensions: 12" x 12" x 3.5"
The Presto FlipSide 3510 Belgian Waffle Maker draws an unqualified recommendation and Best Buy designation from a professional test kitchen. Thousands of happy owners agree, saying it makes the best waffles they've ever eaten and does so consistently, waffle after waffle. The 3510 is small enough for even the tiniest kitchen, and includes a nice array of features that make it very simple to use. Durability is another plus, with some owners reporting they've had theirs for years. Specs that Matter Waffle type: Belgian, makes 1 Cook time: 5-8 min Dimensions: 9" x 10" x 15"
For those who aren't happy with just wiping their waffle maker down to keep it clean, the Hamilton Beach 26030 Belgian Waffle Maker has removable non-stick plates and a drip tray that can all go straight into the dishwasher, and users say they come clean very nicely that way. The indicator lights make it easy to use, and the adjustable browning control offers some customization. Most importantly, it also turns out great, fluffy yet crisp Belgian waffles. 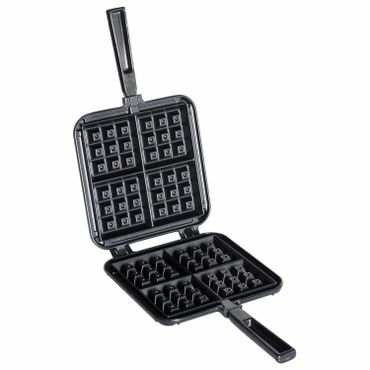 Specs that Matter Waffle type: Belgian, makes 4 Cook time: 3-4 min Dimensions: 2" x 16" x 8.5"
If you're ready to tackle the challenge of making waffles by hand, both home users and expert testers love the Nordic Ware Belgian Waffle Maker. It heats consistently and evenly, although there's a bit of a learning curve, and cooks four waffles at once. Waffles releases quickly and it cleans up easily; you can even submerge the entire thing if need be. Thin handles make it easy for the Nordic Ware Belgian waffler to lie flat, even on flat-surface electric stoves. Specs that Matter Waffle type: Belgian. makes 2 Cook time: N/A Dimensions: 9" x 7" x 2"
The Coleman Waffle Iron is the perfect size for camping, tailgating or living -- and cooking -- off the grid. It cooks two waffles at once and has no moving parts that could be damaged. The non-stick coating works best if it's brushed with cooking oil and then preheated before pouring in the batter. Even if you're "just" cooking at home, the Coleman Waffle Iron is a great choice for those with small kitchens or limited space. American-style waffle irons are used to make traditional waffles, which are thin and crispy with relatively shallow pockets. This means they cook fairly quickly, too. The savory batter used for this type of waffle makes it particularly well-suited to making special shapes like hearts, or for use in place of bread for things like breakfast sandwiches. Introduced in North American in 1962, Belgian waffles usually use a yeasted batter that results in a waffle that rises, making them thicker and softer than American waffles -- although they should still be crispy on the outside. They're larger too, which is why they need a different type of waffle maker than traditional, American-style waffles. The deeper pockets on Belgian waffles are great for holding toppings like syrup, whipped cream or fruit. Although stovetop waffle makers are a little harder to use than electric because you have to regulate the waffle iron's temperature and cooking time, they're also more versatile. They can be used for tailgating, camping trips, or during a power outage (if you have a gas stove). 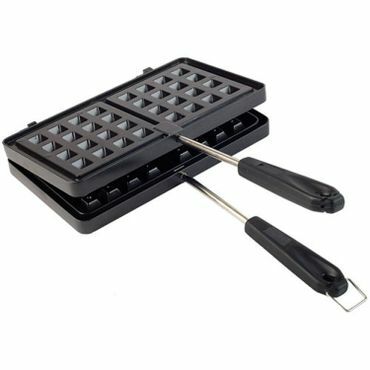 Stovetop waffle irons are usually much smaller and thinner than countertop models, too; so they're the ideal choice for small kitchens with limited storage, camping or tailgating, off-the-grid living, or anyone who enjoys the challenge of learning to create the perfect waffle by hand. There's nothing like the taste of a crispy, golden-brown waffle straight from your own waffle iron, but the key is a combination of a good waffle maker and good batter. A substandard waffle maker or poor batter will make even the most generic frozen waffle look good. 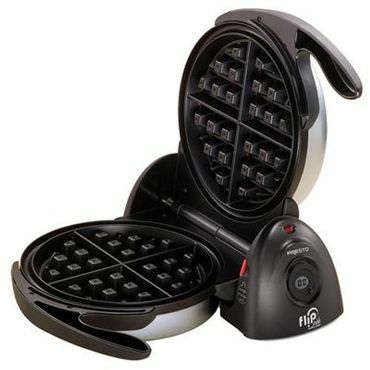 Most modern waffle makers run on electricity and can be adjusted to produce lighter or darker waffles. Many, but not all, have indicator lights and audible beeps to cue you through the preheating, battering and cooking stages. Even more important, the waffle maker should maintain consistent, even heat to make sure your waffle isn't overcooked on the outside and mushy on the inside, or cooked in some places but not in others. Once the waffle is done, it should release cleanly from the waffle maker's grids. Most waffle irons come with a non-stick coating to make this easier, but even with the best non-stick waffle iron you'll get better results if you apply a bit of cooking oil or spray before adding the batter. That non-stick coating and oil combo not only results in pretty waffles on your plate, it also means cleanup is a snap because you won't have to scrub bits of stuck waffle out of the grids. Some electric waffle makers have removable plates that can be tossed in the sink or dishwasher. If you're dealing with an electric waffle maker that doesn't have removable grids, you can't dunk the whole thing for a good cleaning -- so a soft-bristle toothbrush or damp rag are your best cleaning options. Finally, be aware that if you're getting so-so results from a waffle maker that usually draws rave reviews, the problem might be your batter instead of the machine. Users who substitute pancake batter for waffle batter quickly find out that there is, indeed, a difference between the two. Pancake batter in a waffle iron generally produces a heavy, dense mess that'll stick to the waffle iron like glue, and users warn that some "waffle recipes" found on the back of pancake mix boxes don't do much better. If you're into creative pancake making, you'll do better cooking them on a stovetop skillet or electric skillet, both of which we cover in separate reports. "The 3 Best Waffle Makers, Ever (According to Our BA Test Kitchen)"
"Waffle Makers That Make Your Morning"
Waffles are a popular breakfast (or anytime) food, and waffle irons are popular with expert testers and test kitchens as well. We found plenty of excellent, comparative tests of waffle makers at Cook's Illustrated, Wirecutter, Bon Appetit, Consumer Reports, Your Best Digs and Top Ten Reviews, among others. As always, though, with any kitchen appliance, user reviews are king because they tell how the appliance does under real-world conditions with a real person at the helm -- and how long they hold up under that real-world use. Combining all those terrific resources with our own kitchen experience led us to our recommendations for the waffle irons that are easiest to use and clean, and, of course, make a perfect waffle. 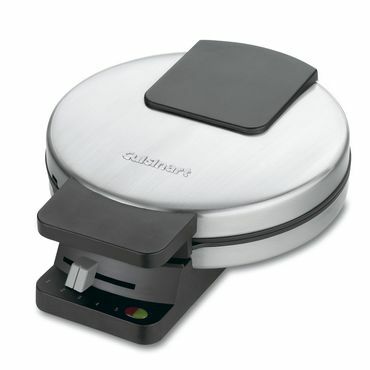 When it comes to making American-style waffles there's no question: the Cuisinart Round Classic Waffle Maker (Est. $30) is the winner by a landslide, drawing hundreds of enthusiastic user reviews and kudos from experts like Your Best Digs, Wirecutter and Good Housekeeping. The Cuisinart waffle iron turns out one waffle at a time, with five doneness settings to choose from and indicator lights that tell you when it's ready for batter and when the waffle is done. The Cuisinart WMR-CA has been a budget pick at Wirecutter for multiple years. "It truly excels at making consistently thin, crunchy waffles," write the Wirecutter editors. They say that a bit of uneven browning they noticed in their test (there's a darker brown patch on the center) is just aesthetic and doesn't affect the waffle's crispness or taste. It's also a top pick from Your Best Digs. Owners love the Cuisinart Round Classic's performance too, saying they're happy to finally find a good waffle maker that makes something other than Belgian waffles. In fact, this little machine took almost a third of the survey vote in a poll from Lifehacker. Users say that it takes two to three minutes per waffle and that as long as you wait for the waffle iron to preheat and apply a little cooking oil to it before adding batter, you'll never have issues with waffles sticking. There is a grooved "spillover" reservoir around the waffle grid; any excess batter gets funneled here and it also cooks, essentially making a bigger waffle. It can't hold much, though, so be careful how much batter you add. The Cuisinart Round Classic Waffle Maker also has a non-stick coating (although you'll want to apply a little cooking oil beforehand for best results), and it's small enough to take up very little space, especially when stored on its edge. Watch your fingers, though: testers for Wirecutter and Your Best Digs warn that steam sometimes vents onto the handle when you open the lid, making it hot to the touch. Users who encounter this issue solve it by putting something heavy on top of the waffle maker's lid to keep it shut as the waffle cooks, which in turn stops the steam from escaping; or you could just wear an oven mitt when you open it. While this Cuisinart is undoubtedly a top performer at a great price point, it does only cook one waffle at a time, and the Wirecutter editors point out that it's not as sturdily built as some of the competition -- a point echoed by many users. That may make this waffle iron best for either small groups or occasional waffle-making. That said, Cuisinart offers a three-year warranty -- right up there with some pro-level appliances that cost six times as much. The Cuisinart WMR-CA is also versatile, with users saying it's even great for making foods like hash browns, bacon and potato cakes. Like most electric waffle irons, the Cuisinart WMR-CA waffle maker isn't meant to be submerged, and the waffle plates are built right into the machine, so you can't remove them for a good scrubbing. Surprisingly, removable plates are relatively rare, especially in the American/traditional waffle maker category. But the Black and Decker G48TD (Est. $40) has them, which makes it very convenient to use. Not only do the non-stick waffle plates pop out for easy cleaning, they also have a completely flat reverse side (also non-stick). Flip the plates to their flat side and open the G48TD's lid all the way, and you have yourself a mini griddle for cooking things like pancakes and bacon; or close the "floating" hinged lid and use it to toast sandwiches. The Black and Decker G48TD earns a nod from the lifestyle website Groom and Style, and many positive reviews from users who like that it can make four waffles at a time -- a plus for larger families, although you'll get more even browning if you let the heating plates warm back up for a minute or two between uses. Of course, that four-waffle capacity means this waffle iron has a larger footprint that single-waffle irons, and you can't stand it on end to save storage space. But most say they're more than willing to give up some counter space to this appliance and a little bit of control over the final waffle color in exchange for its versatility and the ability to give it a thorough cleaning. That said, quite a few users say that this waffle maker isn't as sturdily built as previous versions of the same model, and that if you don't get the top heating plate aligned just right, it can fall off -- an injury hazard if the plate is hot. The top of the G48TD also gets very hot. Some use pliers to bend the metal clips that hold the heating plates in place, which helps them line up better -- or you can just use an oven mitt to protect your hands. If you're willing to pay for a classic waffle maker that doesn't require much fiddling, also consider the All-Clad 99012GT Classic Round Waffle Maker (Est. $130), which draws praise from Good Housekeeping, Top Ten Reviews and Groom and Style for making one perfect waffle after another. "No fancy features here -- just perfectly crisp, buttery waffles, batch after batch," writes Betty Gold for Good Housekeeping. Users are almost universally positive in their praise for this waffle maker's ability to turn out consistently beautiful and golden waffles, with a perfectly crispy exterior. This consistency is helped by the All-Clad's unique design -- steam is released through a vent in the top of the unit instead of building up under the lid, which cuts down on soggy waffles. On the downside, many users report that the locks on the sides of this unit get hot and it's a bit slow to preheat, at about 6 minutes. If you're patient enough to let the All-Clad 99012GT preheat first, though, it only takes about three minutes to cook each waffle, and the seven-setting browning dial gives you great control over the results. Allows you to control the heat. Makes just one waffle style.